Business description - Godha Cabcon & Insulation is one of the leading manufacturer of ACSR/AAAC/AAC Conductors. It is one of the leading companies in the State of Madhya Pradesh and has latest machines having best technology. Its manufacturing unit is located at 36-D, Sector B, Industrial Area, Sanwer Road, Indore - 452 006, Madhya Pradesh. The company’s product range includes All Aluminium Alloy Conductor (AAAC), Aluminium Conductor Steel Reinforced (ACSR Conductor), All Aluminium Conductor (AAC Conductor). 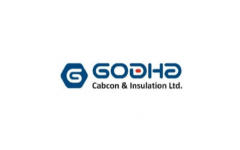 Godha Cabcon & Insulation IPO allotment status is now available on Karvy Computershare’s website. Click on this link to get allotment status.